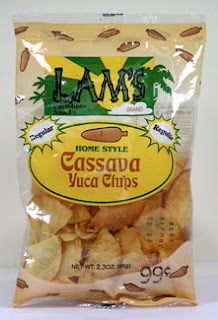 New from Lam Snack Foods Inc. are these Cassava Yuca Chips. The cassava is a plant whose root is generally used for food purposes. Yuca is the spanish word for the same plant. I've never had cassava chips before, though I would certainly like to write a review of this product, if Lam Snack Foods wouldn't mind sending me a free sample (hint hint). They come in 2.3 oz. bags priced at 99 cents.